Anyone who thinks that Fay Wray was just the girl screaming in King Kong’s hand as he climbs the Empire State Building is in for a big—and pleasant—surprise. 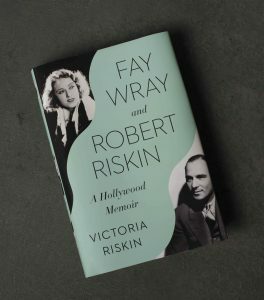 Her daughter Victoria Riskin has written a fascinating, richly detailed and superbly illustrated account of the lives of two remarkable people, Fay Wray and star screenwriter Robert Riskin, that spans one of the most interesting periods of Hollywood from the advent of the talkies through the depression and the war and on through the time of the Hollywood blacklist. This is not only the love story of two brilliantly talented people, it is a brilliant piece of cinematic history, at one robust, touching and deeply satisfying, with a cast of characters that includes almost everybody of interest in those tumultuous years in the motion picture business. For anybody who is interested in the movies, Victoria Riskin’s book will be must reading.